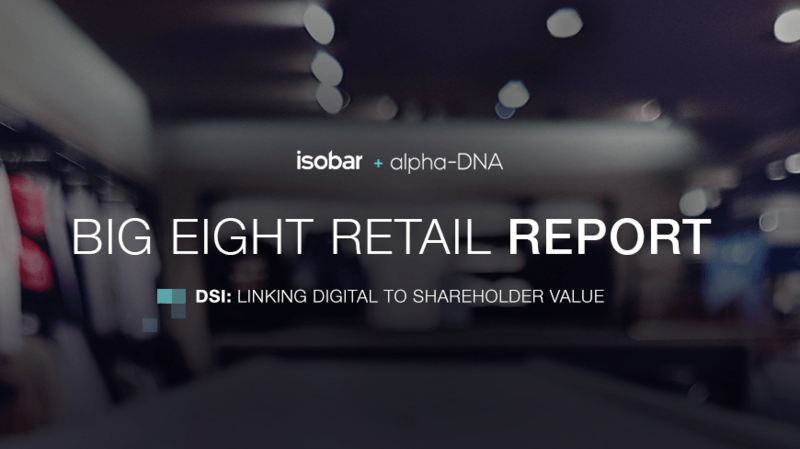 Isobar U.S has launched its latest Digital Strength Index (DSI) report, focused on “big retail.” The report highlights over 350 digital properties over 44 brands from the U.S’ eight large consumer retailers - Walmart, Target, Costco, Best Buy, Kohl’s, Macy’s, Nordstrom and JC Penney - based on revenue and the current trends and issues the entire industry is facing. It’s easy to say Amazon will reign supreme after it lays waste across the retail landscape. But what we see are companies fighting back. They’re starting to duck and weave rather than stand still while getting punched in the face. And, some are even starting to jab back. Some retailers are forging their own digital paths based on their own strengths, consumers and legacy assets. The market is rewarding those with clear and compelling visions aligned with their brand and customer base. Walmart’s strength in defending its size in the digital context relative to Target, amid the onslaught of Amazon, is noteworthy. Despite lots of activity, Target’s digital momentum is slow and we project it to continue to face headwinds in the near/mid term, even if it is operating from a smaller base of revenue. Costco has a unique position in this report, as a rare bright spot of financial success that outperforms its digital metrics. Costco could strengthen its digital position and accelerate growth even further. Developments such as Best Buy’s e-commerce and digital experience enhancements, combined with its productivity initiatives in recent times and juxtaposed against the recent bankruptcies of direct competitors like Radio Shack and HH Gregg have helped stem its revenue decline. The results are evident in its recent uptick in stock price performance, though the long-term headwinds from disintermediation in the electronics retail category remain ominous. Department Stores continue to struggle for topline growth across the board. Macy’s and JC Penney lag the category in digital strength. Among the four department store competitors, Nordstrom is the leader with digital momentum and e-commerce trajectory pointing to growth. But this is a tough category so Nordstrom’s outlook is really just “less bad” than the others. Download the full report report here. The DSI is based on over five years of data gathering, analysis and benchmarking, the Digital Strength Index is an aggregate measure of the digital performance of the top 1000 public companies in the US. The index can determine those companies’ relative digital position across a composite set of analytic measures. Most importantly, the index translates the digital strength score of companies into forward looking top-line growth acceleration expectations. Learn more about the Digital Strength Index here.